Then I remember the New York times story of Kitty Genovese who was stabbed over a half-hour period near an apartment where many of the people who heard the screams didn’t call the police simply because they didn’t want to get involved. 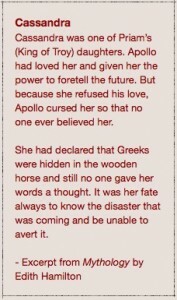 Were they / we apathetic, cruel, evil people? Probably not any more so than others. More likely they / we were human beings overwhelmed by the moment without a strong enough framework to take the right action. We were frozen unable to move like in a bad dream. What does it take to respond appropriately in the moment in these highly charged situations? It takes much more than just being in the moment. 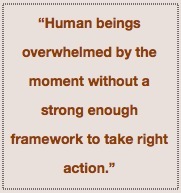 It also requires understanding that moment and being prepared for it. Here is a small scenario to illustrate the factors involved. A curious thing happens at that moment of decision. With hopes and social pressures high, you may start to “bend the map” (see Deep Survival), a process by which you try to alter reality to match your expectations. You begin to overestimate your skills and that of your peers. You judge the weather to indicate great weather. You fail to even entertain the idea of reassessing your capabilities and equipment. It just “feels” right… so you roll the cosmic dice with your life. What happened? The social pressures, the heightened emotions got in the way of measured thought. Furthermore, the voice of the moment always seems more urgent and important than the faint voice of the future which may or may not come to pass. 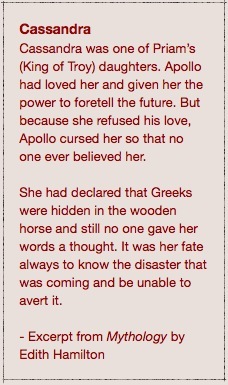 It’s your own personal Cassandra, that Greek mythological figure who predicted the future but was believed by no one. While nothing may have happened for that trip, sometimes events conspire to create the disasters or accidents that could have been prevented. On January 28, 1986 at 11:38 am the Challenger lifted off while broadcast on three major TV networks. Seventy-three seconds later to the horror of those watching, the external fuel tanks ruptured and killed the crew of seven. Later investigations revealed that the O ring which normally sealed the joints between sections on the booster rocket failed under the cold launch conditions. With the hundreds of thousands of people involved and multiple complex systems working together, one might expect that a problem or two may slip through. However, what NASA failed to understand was not so much the technical behaviour of the O ring as it was the human behaviour of the system. Concerns about the O ring had been raised. One contractor went as far as to strongly advise that it was unsafe to fly. These concerns were ignored for the same reasons you might ignore the posted weather report. Eleventh-hour decisions, crisis mode thinking, social pressures, uncertainty of data all prevented warning signs from being acted upon. With the “world watching” on the networks and pressure from the Reagan administration to launch, NASA’s culture inadvertently shifted from “prove to me it is safe to fly” to “prove to me it is unsafe to fly” (see Flirting with Disaster). All this is to say that if the consequences are high, the system complex, and the understanding uncertain, your first gut instinct response is not likely to be a good one. How can you avoid getting caught up in the moment like NASA employees or the New York apartment dwellers? 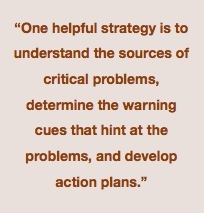 One helpful strategy is to understand the sources of critical problems, determine the warning cues that hint at the problems, and develop action plans for the cues. For example, an important lesson in self-defense is awareness of surroundings and the ability recognize threat cues. Threat cues are warning signals that potentially hint at actual threats. Perhaps a person walks towards you in a certain way, or a person watches you for longer than normal. Taken together with other environmental cues (time of day, location), you may be able to recognize a threat and act on it (crossing the road, going back the way you came) before it becomes life-threatening. For me, I have taken to the habit of turning towards any shouting or swearing to scan the situation. Should I call 911? Should I intervene? Or do I just need to continue watching? In the hiking situation, having an exit plan in advance for unforeseen circumstances would help while NASA would have done well to build in protection against last-minute decisions. Knowing what cues to look for, however, requires a deep understanding of the systems in operation. Serious hiking requires an understanding of survival situations. A space shuttle launch requires generations of people experimenting, building, learning. It is no minor task! While we need to build our ability to recognize warning cues and act on them, organizations must also build in systems to enable dissenting action. Social norms and culture are after all more influential than individuals. Thoughtful companies have provided third-party phone lines for employees to report ethical breaches recognizing that “ratting out” your peers is often considered a worse crime than reporting the truth. Nevertheless, it is your responsibility to take action when needed. While we may never have to watch others die like Kitty Genovese, we are all engaged with high pressure situations that test our character. So take the time to understand the system, recognize the warning signs, and act on them despite what others may say or think. It is startling to note how ingrained systems or routines as I call them influence our lives. From something mundane as always following the same road to and from work to always searching the same websites on every browse session, we are caught up in the mundane. The institutional and systemic is probably more powerful then any creative force over the long term in influencing people. I use this in my work when I try and make normal certain behaviors for students, small increments but within a solid framework guarantee certain kinds of behavior. Hence some of the most ‘orderly classrooms’ out there have a strong sense of routine. I remember one author praising a teacher who had a classroom with such strong routines who commented the classroom would run the same with or without him the ‘kids were so well trained’ . Now the problem with the above is that very student is unable to think on their own when faced with a new situation, routines/systemic action etc are useful only if they equip you to deal with a diverse range of issues that pop up if however they are maladaptive and equip one with a narrow set of capacities then the institution is dangerous. The society in which we live asks us to manage knowledge, be agile thinkers who are able to deal with change by constantly learning and adjusting…how do we make sure everyone is prepared for this?….or are we going to have a large majority of people who go through life as zombies ruled by routines just because its the easier thing to do. Rehearsing ways of breaking out and recognizing cues could be one way of breaking out but is it enough, is it not simply putting another layer of more complex system/routine on top of an older simpler version? Does the answer lay in principles which drive reactions? Principles which are broad enough but specific enough to allow for timely action? Do things have to be done so fast? In the case of the stabbing mentioned above…was there a pattern of domestic violence involving that woman that the neighbors had grown accustomed to loud noises etc from where the woman lived? what were the antecedents? who noticed them and learned to ignore them? Chris you are making me think!